Recently, I was asked to find organizations with CKOs (Chief Knowledge Officer). It occurred to me that I haven’t really heard of one in recent memory. So why is that? While I don’t have a definitive answer, I have a suspicion (a hope really): not only are CKOs not needed, we shouldn’t want them. 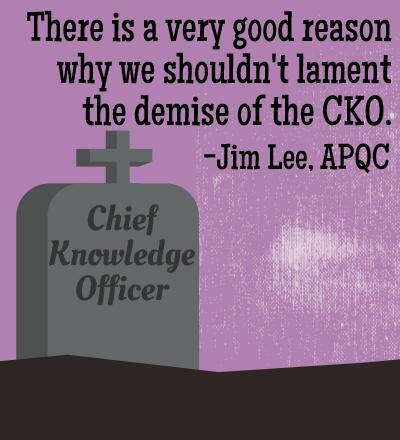 That may seem like an outlandish statement from someone who loves knowledge management, but there is a very good reason why we shouldn’t lament the demise of the CKO. First and foremost, organizational knowledge management shouldn’t be a function—it should be a capability. The difference in those words makes them worlds apart. A function implies constraint, clear delineation of roles, and perhaps even silos of responsibilities! Conversely, creation of new knowledge, sharing of expertise, and taking advantage of organizational expertise can, and should, be done by everyone in an organization, from the newest employee to the most senior, from the least paid to the highest. To illustrate the differences between functions and capability I like to use quality management and mathematics. Every organization of any size has a quality department, likely one with a VP of Quality or similar title and responsibility. 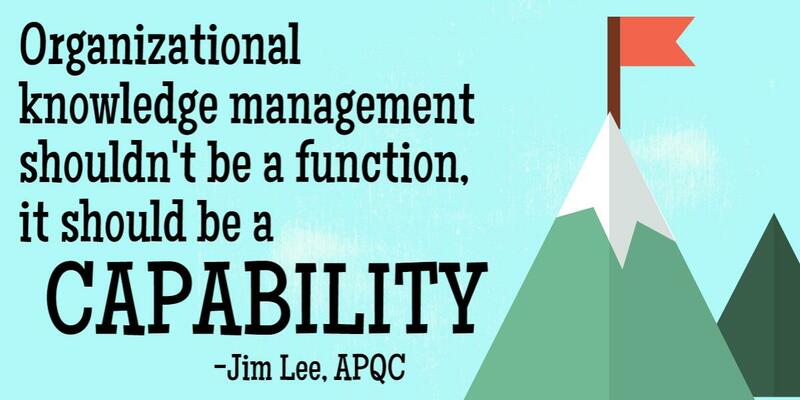 So if everyone is responsible for quality, why would organizations have a quality function? In the case of quality, there exist specialties and professional quality management needs that require extensive training, tools, and even customer requirements that must be met. Some of the needs of quality management just can’t be done by anyone nor should they if we agree with Adam Smith (think The Wealth of Nations). Now think of mathematics. For most people, we’re not professional mathematicians (statisticians, actuaries and the like), but we still need to have some comprehension of mathematics to do what it is that we do. Not calculus-type math (I haven’t integrated the area under a curve in over 30 years, and deriving third order differential equations is what caused me to flunk out of school), but at least enough math to do some real analysis when needed. For most people then, their understanding of mathematics is more than sufficient to perform their roles in an organization. In other words, everyone has the capability to contribute to the welfare and improvement of the organization using their math skills. Now think of knowledge sharing. We may use the term knowledge management to describe the portfolio of ways to share our expertise, but the real behavior is the identification, sharing, and reuse of that expertise. Like mathematics, everyone should be able to do that, shouldn’t they? You’ve heard what I think; now see how best-practice organizations like Accenture, Lockheed Martin, and MetLife do it with our new KM guide, Structure and Staffing of Best-practice KM Programs. Interested to hear your response to the pending new Version of ISO 9001:2015 scheduled to be published in Q4 2015. Organizational Knowledge is a new requirement. ISO 9001:2015 defines requirements for the handling of organizational knowledge in the following four phases, which are analogous to the PDCA cycle: 1. Determine the knowledge necessary for the operation of processes and for achieving conformity of products and services 2. Maintain knowledge and make it available to the extent necessary 3. Consider the current organizational knowledge and compare it to changing needs and trends 4. Acquire the necessary additional knowledge. By introducing the term “knowledge,” ISO 9001:2015 aims to raise organizations’ awareness of the management and linking of know-how in order to position them for the future. Jim I appreciate your perspective on CKOs. Having served as one, I wanted to broaden the perspective a bit. I understand your view that “organizational KM shouldn’t be a function, it should be a capability.” I am suggesting that effective and sustainable KM concepts, strategies, and implementing practices – a sustainable knowledge management environment benefits when there is “both a KM function AND a capability.” It is my experience that lack of one without the other marginalizes the value that can be created from the knowledge within the organization. In many organizations, this comes together in the CKO position and person. I believe it is helpful to think of the CKO in the context of other organizational leadership and the functions and responsibilities they have with respect to developing and managing the organization’s assets and delivering the organization’s mission. For example, the Chief Financial Officer (CFO) manages and helps to leverage the financial assets of the organization; the Human Capital Officer (HCO) manages and leverages the value of the workforce, and the Chief Technology Officer (CTO) managers the technology assets of the organization. For me, it makes sense to have an organizational leader that is responsible for and focused upon developing and leveraging the intellectual assets (the knowledge) of the organization. This individual can be the CKO. You comment, “Now think of knowledge sharing. We may use the term knowledge management to describe the portfolio of ways to share our expertise, but the real behavior is the identification, sharing, and reuse of that expertise.” Well said. I would also say that having someone model the knowledge sharing behavior as a way to begin to change the knowledge sharing behavior of the organization is essential. This can also be the CKO. CKOs are also not just an assigned position. They are a lever for change. Since KM involves integrating people, processes, and enabling technology, the Chief Knowledge Officer (CKO) requires a specific skill set – a person who can understand the organization, its business environment, and its big picture and tie all of this to the strategic plan and measures of success for the organization. The CKO must be someone who not only can be cheerleader and a teacher, but also has a vision of knowledge sharing with the authority and experience to enable and facilitate the corporate culture and processes to achieve the KM goals. This supports function AND capability. The skill set for the CKO is a range of skills including the following: •	Interpersonal communication skills to convince employees to adopt cultural changes •	Leadership skills to convey the KM vision and passion for it to leadership and the cross-functional teams supporting KM in the company •	Business acumen to relate KM efforts to efficiency and profitability •	Strategic thinking skills to relate KM efforts to larger goals •	Collaboration and facilitation skills to work with various departments and facilitate their ability to work with each other •	Understanding of the relationship of enbaling technology and its role in enabling success through KM •	Demonstrated experience as a practitioner in delivering results through KM The right organizational positioning and reporting structure is only a start. Actual success also depends on how well the CKO takes advantage of the skill set they possess. Again, this supports value in function AND capability. In fact, one of the most powerful attributes, and the one I believe is most required for success, is the CKO’s ability to achieve results through their peers. Seeing the value of leveraging knowledge and then adapting business and operational processes to make this happen “as part of the way the organization does business” will only occur if the peer leadership and the organization really understand and believe there is value in doing do so. This facilitates capability. I tend to agree with the view that everyone in the organization should contribute and consume knowledge. There are two necessary conditions that need to be satisfied for collaboration/sharing to survive and thrive - 1. primary being the push from the executive management for doing more with less to the senior and middle management 2. Someone who can conceptualize the platforms, define taxonomies, select appropriate technologies or products - whether we call him/her a CKO or HR manager (as the reference from APQC shows in some orgs) - it may not matter - as long as she has a good understanding of what KM is expected to provide as business outcomes and can gain sponsorship of the executive management. In some sense, this role is similar to the statistician that you mention in your example. Google is a good example - most the content displayed on search is not owned by Google but the search engine, the prioritization rules and the entire infrastructure are provided by them so that the 'Knowledge Seeker' can find the relevant content relatively easily. Thanks to everyone who took both the time to read my musings, as well as time to post your thoughtful insights. Taking them in order of your responses, I’m happy to keep the conversation going. Obviously, the introduction of “knowledge” within ISO is not only a good thing, it begs the question: “What took them so long?” Beyond that however, I think a more interesting question is the one regarding how organizations will show that they’ve achieved the requirements of effective knowledge use. On this point, I have some thoughts based upon my previous life as a QS-9000 auditor (the then automotive superset of ISO 9000). That is, a very simple but powerful question used in those audits can help solve the puzzle: “Show me the evidence of [fill in the blank].” Using a maturity model, such as APQC’s Levels of KM MaturitySM (https://www.apqc.org/km-capability-assessment-tool) might be one of the ways to do just that—to show increasing capability of enterprise knowledge usage through evidence based norms. Regarding the CKO role—the thing that started this conversation—to that I would add okay, it’s fine to have the designated position if you can get it. The difficulty is in getting it in the first place. Then, once the position is filled, how easy will it be to add the requisite staff that will be needed in order to create the knowledge sharing infrastructure? So the better question here might be: “What does it take for leadership to be willing to staff a group of KM professionals so that a CKO can be appointed to lead them?” After all, if the CKO itself is the only position necessary, then we’re back to the problem of a single function, and even worse, a function embodied in a single person. In truth, I’m not so opposed to the notion of a CKO, I just wonder how effective one can be in the forest that is the CINO (Chief Innovation Officer), the CDO (Chief Diversity Officer), the CEMO (Chief Emotions Officer), the CMO (Chief Meaning Officer http://www.forbes.com/sites/nishacharya/2015/05/19/jack-welch-be-the-chief-meaning-officer/) and so on, all occupying the senior leadership table. Finally, with respect to the comment regarding the conditions necessary for collaboration and sharing, I would say, “thanks!”—with an addendum. Certainly the leadership’s engagement and continued support is needed, as well as the technical expertise necessary to design, build, and maintain the infrastructure. To that I would add the needed rewards and recognition since often, “what gets measured gets done.” In this instance measurement would mean acknowledging the good behaviors of knowledge identification, sharing, and reuse. Back to the point of the comment however, it does corroborate the sense that an effective knowledge management program does include some significant needs like sponsorship, technical acumen, and even a KM leader by some title (CKO or otherwise). Thanks again to everyone for giving me more food for thought on the subject. To the poster on 11/11/2015, thanks for taking the time not only read my post but to offer your insights as well. While I've added another post to clarify my initial statement above, I am happy to discuss your viewpoint regarding this specific post. First, please help me understand the role that you cite: the Chief Data Officer (CDO). I'm sure that I'm misunderstanding the connection regarding how the CDO supports knowledge creation and dissemination. That is, your last paragraph states, "...When a decision is taken based on data and information, the chances of inaccuracies are high...." So why a CDO and not a CKO? Or, perhaps the CDO's role includes knowledge creation from data? If so, it would seem then that the most appropriate title would indeed be a CKO to distinguish it from the often mistaken notion that knowledge management is merely content management. Certainly, not all knowledge is documented, nor is "data," so the remit of any CDO ought be to capture and disseminate any known "content" whether explicit or tacit. For any organization that feels compelled to have a CKO title, I say go for it. I just hope that such a title is not viewed by senior leadership to be "the next shiny thing" to be discarded when it is inconvenient to have such a lofty role. In fact, my subsequent post to this one restated my position that so long as a role that has full leadership support exists, it can be titled anything--like KM leader, KM director, etc.--and be just as effective. By the way, your comment that project management should be an enterprise capability and not a local one is interesting to me. That's because I've been a part of a PM Center of Excellence at a Big 4 consultancy. Surely that was needed for specific purposes. However, ironically, the reason for its existence was to educate and permeate the entire organization to become better project managers and thus become "everyone's business." Thanks again for your time and consideration. I'm glad that it offered you a venue to get your insights publicized for continuing discussion. I hope that future posts will be just as helpful to you.